The Election of new LCP Officers as presided by Rev. Teodorico Taran, Jr., chair of the Committee on Elections. 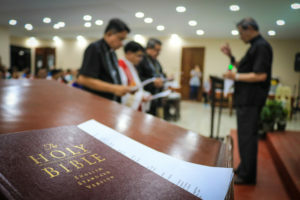 The Lutheran Church in the Philippines re-elects its three key positions for another 3-year term during the LCP 24th General Convention held in the Lutheran Center, Sta. Mesa, Manila on October 24-26, 2017. The Revs. Antonio Del Rio Reyes (President), Felipe Ehican, Jr. (Vice President), & Henry Paul Roa (Secretary) were all re-elected in their respective positions. The elections occurred smoothly after hours of plenary discussions about proposals regarding Policy, Finance, Christian Education and Mission & Evangelism. Installation of the new LCP Officers during the Closing Worship Service of the LCP 24th General Convention. Rev. 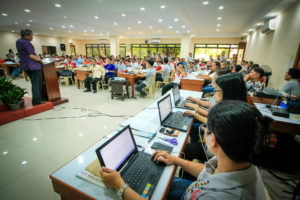 Reyes’ administration focused on the LCP being a self-sufficient church having projects on consolidating LCP properties to generate funds for its programs and activities. “When I started my term in October 2014, I envisioned LCP to become financially self-supporting”, Rev. Reyes stated in his message and report during the opening ceremony of the 24th General Convention. A delegate of the Convention excitingly congratulates Rev. Reyes on his re-election. Establishing a good working relationship with other Lutheran Church bodies are also given attention by the Reyes Administration. On this 24th General Convention, one of the proposals that was approved is the Establishment of a partner-church relationship between LCP and the Evangelical Lutheran Church of Papua New Guinea and Evangelical Lutheran Church in Bavaria, Germany. Along with Rev. Reyes, the North Luzon Highland District President, Rev. 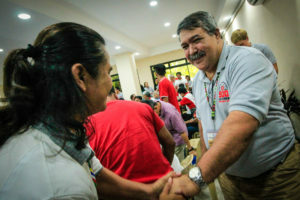 Felipe Ehican and South Luzon District President, Rev. Henry Paul Roa work a hand in hand to continue God’s mission through LCP of bringing the good news not just here in the Philippines but also in abroad. With the guidance of the Holy Spirit, and a new sense of direction through the LCP Vision, Mission and Core Values, let us continue to pray for our newly elected officers and all the church workers of LCP all for the glory of God alone! What a celebration of the 500 years of the Lutheran Reformation! Advent Greetings in Jesus’ Name!